Right by a great googie monument from the 1964 World's Fair (the Wisconsin Pavillion, now operated as a radio station) you'll find not one but TWO World's Largest Things - The World's Largest Replica Cheese and the World's Largest Talking Cow. 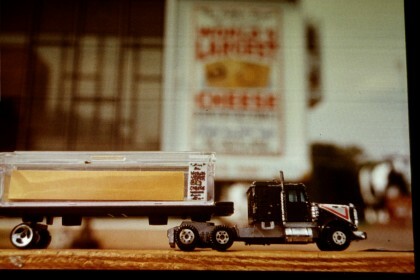 The World's Largest Replica Cheese has to be one of my all-time favorite World's Largest Things. There's a semi trailer housing a large orange styrofoam-or-gatorboard-or-plywood rectangle. It's a replica of the World's Largest Cheese, made my the Wisconsin Dairy Association for the 1964 World's Fair. Unfortunately, they ate the cheese after the fair. Then, they were stuck with a large trailer and some very nice sineage. So, they built the replica cheese! Adding to the absurdity of making replicas of monumental things is the existance of the World's Smallest Version of the World's Largest Replica Cheese, and the resulting meta-photos when the two get together. One of my first replicas, it's also one of my favorites. Polystyrene, 14.5 x 6.5 x 5.5 foot cheddar replica. That would be 16,000 cows in single file, stretching down the road for 20 miles - That's the size of the herd that gave the milk that made the cheese that went to the fair.